Frequency XCEL Toric lenses feature the patented UltraSYNC technology for increased comfort, as well as an inside-out mark for easier handling. These lenses have a monthly replacement schedule. This value pack contains a 400 ml bottle of Laim-Care solution. 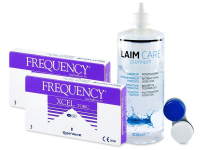 Frequency XCEL Toric are monthly contact lenses produced by CooperVision that are intended for the correction of astigmatism. Their thin edges, together with the advanced UltraSYNC technology, ensure outstanding comfort. Frequency XCEL Toric are not designed to be worn while sleeping.